Everyone wants to surf and feel the oceans power glide under your feet as you slide down a wave. Surfing is one of the most physically demanding sports (and one of the most fun too)! It requires physical strength for paddling out to the break, catching a wave, balancing on the surfboard and eventually turns and aerials. 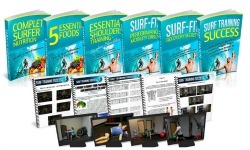 The proper workouts will help you surf better, prevent injuries, catch more waves. 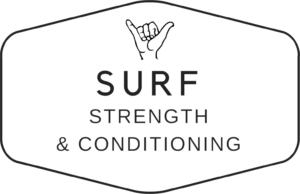 Before you surf, be sure to start with a full body warm-up to prevent injury. After warming up there are several exercises you can do to improve your stamina and strength for swimming, balancing and paddling. Yoga Poses: Sun salutations and styles like Vinyasa and Ashtanga are good for flexibility and muscle strength. Standing Knee Hugs: Standing with your spine tall bring one knee towards your chest. Place your hands around the knee and pull it towards your stomach. Bring the knee as close as possible without rounding the back. Breathing Squat: Perform a squat movement, exhaling as the body moves down, and inhaling as the body comes back up, extending the arms towards the sky. Avoid dumbbell curls and calf raises! Try to workout at least two to three times a week. No exercises can replace the actual act of surfing so but training on land can make your sessions in the water even more enjoyable. If you want to become a better surfer, improving your balance is key. You will also have quicker reaction times and better success at catching waves if you can jump to your feet quickly and easily. Surfing in heavier waves and for long periods of time will require stamina. Interval and endurance training is great for this and can easily be done while traveling or at home. Combining all of these activities will be the ultimate preparation for your surfing adventures! We hope to see you soon at the best Surf Camp in Costa Rica.